Todays, after four decades from the discovery of monoclonal antibodies by Kohler and Milstein in 1975, a dozen of antibodies are used in cancer targeted therapy with different strategies. The success of these antibodies depends on the specificity of antigens expressed on the cancer cells. Epithelial Cell Adhesion Molecule (EpCAM), a homophilic cell-cell adhesion glycoprotein is a well- known tumor antigen, which expresses on epithelial tumors and circulating tumor cells as well as cancer stem cells. The EpCAM signaling pathway is associated with proliferation, differentiation and adhesion of epithelial cancer cells. Here we review EpCAM structure, expression profile and its signaling pathway in cancer cells. In addition, we focused on structure, mechanism of action and success of anti EpCAM antibodies which have been used in different clinical trials. Based on literatures, Edrecolomab showed limited efficacy in the phase III studies. 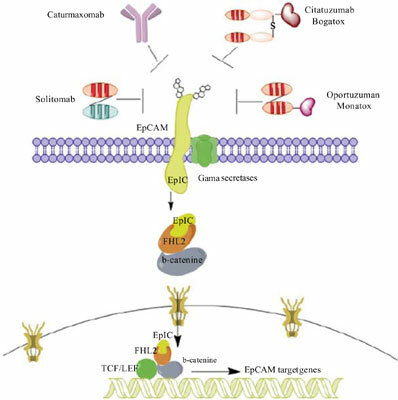 The wholly human monoclonal antibody Adecatumumab is dose- and target-dependent in metastatic breast cancer patients expressing EpCAM. The chimeric antibody, Catumaxomab, has been approved for the treatment of malignant ascites; however, this Mab showed considerable results in intrapleural administration in cancer patients. Anti EpCAM toxin conjugated antibodies like, Oportuzumab Monatox (scFv antibody and Pseudomonas exotoxin A (ETA)), Citatuzumab Bogatox (Fab fragment with bouganin toxin) and immono-conjugate antibody Tucotuzumab (monoclonal antibody with IL2), have shown acceptable results in different clinical trials. Almost, all of the antibodies were well-tolerated; however, still more clinical trials are needed for the approval of antibodies for the treatment of specific tumors. Cancer, target therapy, EpCAM, monoclonal antibody, glycoprotein, Catumaxomab.